Awesome. I've been waiting for this for quite a while. I don't like Firefox very much, I prefer Konqueror. But IMO this is great to show how flexible KDE is and how is it could be for non-KDE applications to interact with KDE. *how easy it could be for non-KDE applications to interact with KDE. Is this using XPart technology? On the bright side, KDE invents so many cool technologies that eventually one of them is a wild success. KDE has been flirting with Mozilla/Firefox for ages but nothing has ever stuck yet. Yeah but... who really needs ActiveX support, anyways? I understand the need for Flash and Java, but AFAIK ActiveX isn't a very popular browser feature (or maybe I've been visiting the wrong (right? :)) sites). Please help me with reaktivate. I need it very badly. I also prefer konqueror for its unicode support and filemanager/webbrowser/network_browser switchability. This is commendable endeavor by our KOOL KDE Developers to even help non-KDE application and firefox is one such adorable application which needs KDE's helping hand :) Good Luck, Have fun!!! kaffeine doesn't support KDE 3.3 or 3.4, then what's the use of it! To crash konqueror!? even the kaffeine-cvs07 version crashes konqueror! Has anybody got kaffeine working nicely on KDE 3.4.x? I'm unhappy with kaffine cause it is the only player which could play everhting thrown at it! but now real streams won't work even worse it crashes konqueror! Kaffeine works fine :-), it will only crash when you close it but that was in Suse 9.1, 9.2, and even in 9.3. Instead of Kaffeine you can use MPlayer. www.mplayer.hq. mplayer works very well using KMPlayer as the Konqueror plugin. KMPlayer is one of the few things I install from source for exactly that purpose. You should try kmplayer ! I like Konqueror interfac more than Firefox, as I do like KDE more than gnome/gtk, but konqueror engine is still a child in front of gecko. > So if the gecko into konqueror makes on kde 3.5 with kpaers embeded on it. Likely not for KDE 3.5. A Gecko kpart will never be part of KDE since that would currently introduce a dependency on a complete Mozilla/Firefox installation (for that matter the Mozilla Foundation really needs to get their act together finally and release an unified Gecko runtime environment for all their products). Well, correct me if I'm wrong, but can't you compile KDE with or without it (by configure script detecting it), and then, the binaries simply detect if Mozilla libraries are present on the system or not, if it was compile with support to it? Something like when you run a program that uses vbrun300.dll, but just fo0r some minor part, so it can run without it also? ...is that the tool-bars always "refuse" to stay where I want them. I always change its tool-bar to look like that of Firefox by moving items from one toolbar to another and merging those that I have to....this works for very few times before everything begins to be placed anywhere. This wastes valuable screen estate and makes Konqueror even ugly! It has been the case in all distros I have used. How does one solve this? To make matters worse, attempting to re-arrange them results in nothing at all! Re-merging will not work at this point. Be sure that you save the result as the profile you are usually using. no, what he says is correct. I've always experienced the exactly same problem my distro since I remember. Tool bar management in Konqueror is due to a revision, I think. Another thing I'd like changed (or better, implemented) is an option to independently configure the double click behaviour on File Types when in the File Management and Web Browser modes of Konqueror. This is another cause of frustration for my daily usage. I have always saved my sessions - ALWAYS. What frustrates me most is the fact that attempting to redo the whole exercise again will NOT work once the toolbars "forget" their settings. But I must add that sometimes, Konqueror will remember these setings magically. Filing a bug report is not very useful because reproducing the behavior is almost impossible. My trouble with konqui is that some images always fail to load on a page ... or the stylesheet does not seem to have applied. I am on a fairly snappy broadband so I wonder what the issue is? Even kde-look.org does not load without some images 'broken' (which in reality exist)! Oh btw, I am using KDE 3.5 on Kubuntu although I have seen the same behaviour on PCLinuxOS, Fedora etc. This is feature I would really like to see with Firefox. KDE-Wallet is more advanced then the integrated password-mananger. Also it would be helpful, since I am using both browsers, so I would only have to type in the password once. No, he wants a centralized place to store password on his machine so that he doesn't have to remember which of several different passwords he used on each website. And he wants to be able to use that whether he's in Firefox or Konqueror. Firefox already has dialogs that ask if you want them to remember your password all over the place, but it can't share that information with KDE apps. Looks like a respective plugin should be written for Firefox. That's certainly not KDE's job though. Well, normally I would say yes. But when an app becomes as important and popular as firefox, sometimes it switches who has to do the work to make things work together. Or both sides can say it's the other guy's job and I can be posting this note 20 months later, of course. Simply having KDE wallet be able to fill in Firefox's master password would be enough, since right now FF asks for that every time you run it, and it does sometimes crash, so that can be several times a day. Truth is the firefox password manager does far more password management for me than KDE wallet does, so if KDE wallet wants more adoption, it could very well fall to the platform to do the work rather than the app. So it goes. I really like the kde wallet for its security, portability, and ease of use and I would like to see a Firefox plugin to support it. I'm surprised no motivated individual has done this yet. I'm guessing the KDE Wallet has a nice simple API to access it and request logins and passwords from it when needed. Wouldn't it involve not too much more than substituting the KDE Wallet for the back end of Firefox's login/password storage system? Sounds like an interesting project to me. No that would not do it, since Firefox does not give a damn about the kde wallet manager. So it would not make any difference if the kde wallet could enter FF's master password, because the wallet is not being asked when you browse to a password site using FF. Also, these people who are asking for a wallet integration into FF want to have a centralized place to store their password, which I personally completely agree with. Your suggestion does not do that. And btw you wouldn't say that the centralized place to store passwords in a K desktop should be the FF password manager, would you?? It is NOT KDE's job to adapt. It seems like people are too caught up in this whole 'whose job is it?!?' question. What I think is: there is NO ONE you could say 'that is their job' to concerning this matter. A centralized place for passwords would be very nice indeed, but since the KDE development does not seem to be aware of this, perhaps some other hobby programmer would have to do it. I presume this would be possible with yet another FF plugin similar to those other ones floating in dozens around in the net. So I can't "Save As" a page to a location outside of the root file system (like a currently unmounted Floppy, Network Location, or Storage Media). Not to say that the KDE Open File dialog is perfect, but it's better than what GNOME has to offer. One thing that the KDE file dialog still lacks is a "Rename" option when a person right clicks a file (although it is possible to rename the file by choosing "Properties"). Not very user-friendly. If there's one thing I love about Windows is that all applications' File-Open dialogs are the same and can do everything that File Explorer can. And File Explorer shows *everything* (Network, CD, Floppy, Local Folders) as nodes in a well thought-out Tree View. You can change the list of icons in a Windows file dialog with TweakUI. I hope you reported that to Mozilla's Bugzilla since it's their job to introduce something like that (unless you want to propose a KDE fork of Firefox which would be ridiculous). is "resolved" the resultion is "WONTFIX." Great? embeded is not too difficult, if you give kparts NS api support. but how about this implementation? for more media plugin interface, pls view the Window Media player and RealPlayer plugin JS interface. How far is this related to last years work for Qt-Mozilla? this is something that firefox(and thunderbird) lacks...even within gnome envrionment. Maybe they should start to support at least DBUS to connect other apps(like address books, or even other mozilla apps) without dirty hacks. Agreed, but sadly it looks like the Mozilla Foundation mostly only cares about Windows as the lowest common denominator. Sorry, but I get most of the webs "active" content diplayable under linux just fine in firefox using the well known available plugins plus mplayer plugin. On the other hand the nspluginviewer (sometimes plus konqueror) crashes all the time for me. Of course this is the fault of bad web authors, bad plugins and bad packagers of my distro - but it makes KDE just look bad, as firefox works well with the same content. I wonder how hard it is to tell mozilla to use a plugin to view HTML? Seems like that'd be an unusual thing to do. Though it would not be hard to put up a page somewhere with a fake extension and mime type (.khtml or something) to test the concept. So it's not such a new idea at all. Re: *NOT* a new Idea! who said anything about a new idea? I am a Linux (Fedora core 2) user - more specifically, I use KDE as my desktop. First let me congratulate you on bringing this long missed feature of integrating a pdf viewer with web browser which is standard in the windows counterpart. 1) Kpdf does not recognise links (web links or internal links). Gpdf does. 2) Font rendering is not up to the mark. The documents opened in kpdf looks crude. Much better (antialiased?) font support is there for Gpdf. 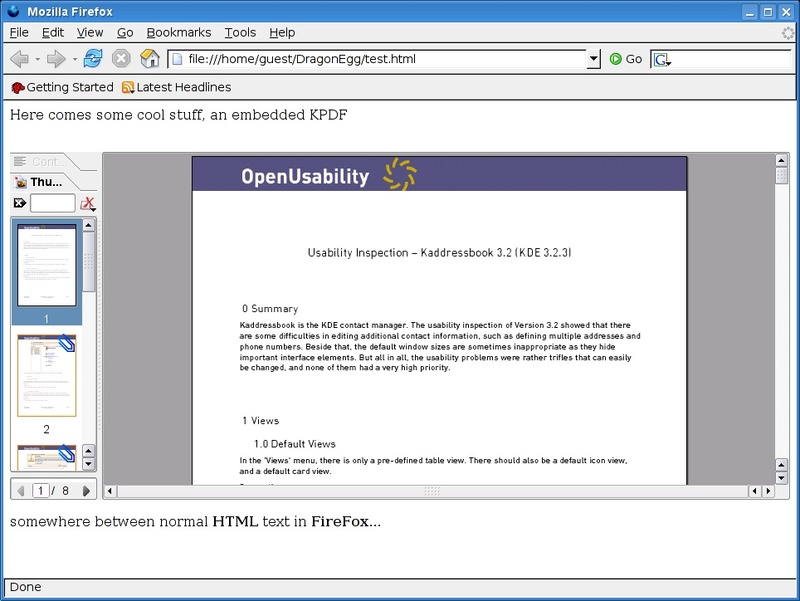 ... this may be because I am using a version of kpdf which was bundled with fedora core 2 (older version). Though gpdf also has its drawbacks. I have found that some pdf documents created using openoffice.org, which when opened in gpdf are garbled, but opens fine in kpdf. But most of the time gpdf works. I am sure these wrinkles will be sorted out in kpdf by the time KDE 4 is released.